Susteen's new Field Acquisition Device is designed to immediately pull evidence data from mobile devices in the field. Cutting-edge new methods of acquiring evidence, allow for the acquisition of encrypted apps, texts, images and more, in less than 5 minutes. Susteen will be hosting a free live webinar presentation on their new Field Acquisition Device, this Wednesday, June 13th at 11:00 am pacific and Tuesday, June 19th at 1:00 pm pacific. 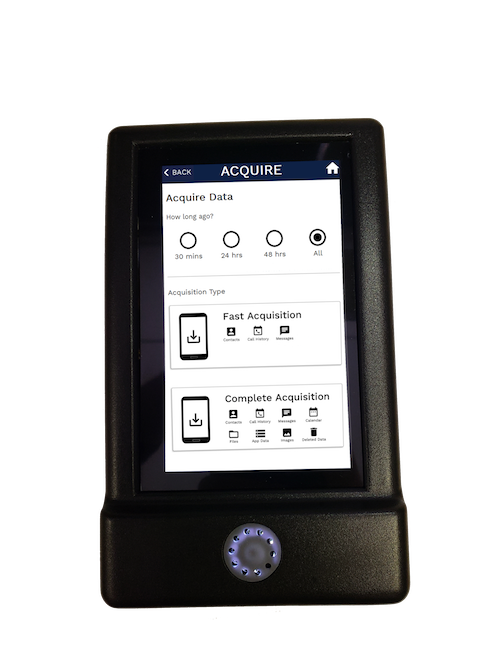 Susteen’s new field acquisition device works with current mobile forensic software in your lab and has 4 new cutting-edge acquisition methods for acquiring immediate evidence from cell phones. Susteen set out to make a product that was affordable for all law enforcement agencies, keeping the price under $1000 and offering complimentary training on this new technology. Easily disperse multiple field acquisition devices in your coverage area. Users in the field can acquire evidence, then send back to the lab for analyzation by digital forensic experts. This game-changer allows law enforcement agencies to acquire data at crime-scenes. Easily pull pictures, texts and more from witnesses at the scene, or do a full acquisition of evidence data from a suspect’s phone. Linked Screen Capture: This is a technological advancement in our industry which allows the software to interact with the phone and preserve exact screen captures of evidence data. This can be used to preserve evidence on just about any application that can be found on the phone by selecting each individual app. 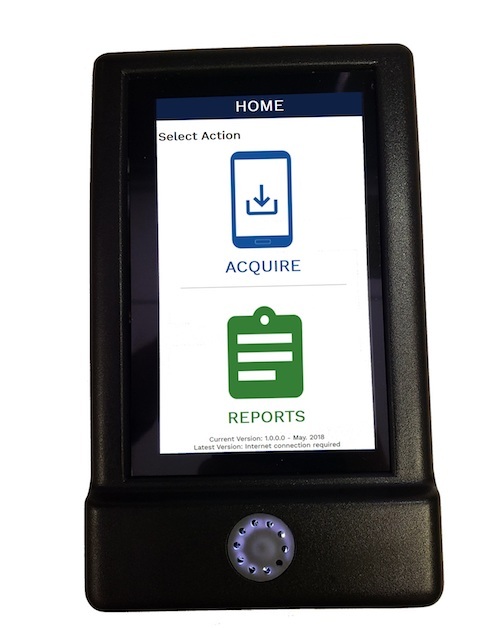 “Real-Time Acquisition” This advancement in the technology allows the investigator to pull the last 30 minutes, 24 hours, 48 hours and full week of data from the cell phone. This allows investigators on scene, immediate access to evidence pertinent to the live situation. 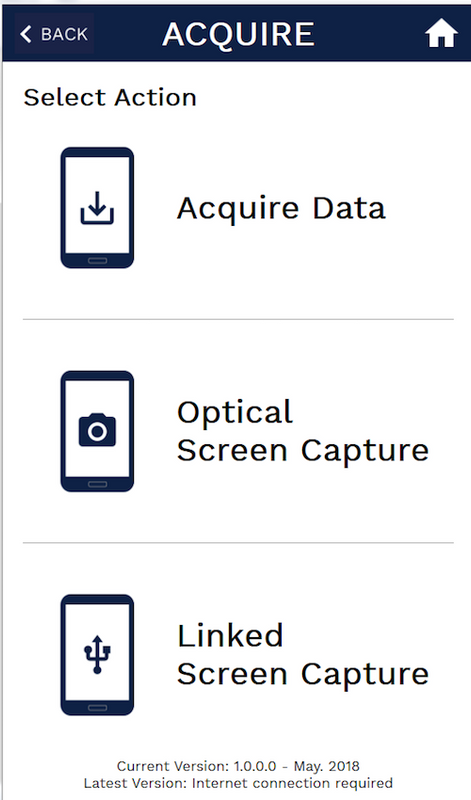 Full Acquisition: This includes calls, texts, call history, images and some application data (more data if phone is rooted). For iOS devices, this includes an iTunes backup file! Optical Capture with OCR method: This method allows the detective to capture screen shots of the device with our embedded camera. These images can be exported easily. Our OCR software finds text found in the images so you can convert pictures into searchable actionable evidence data.